A tornado is a local storm of short duration (usually 5–10 minutes) formed of winds rotating at very high speeds, usually in a counter-clockwise direction (in the Northern Hemisphere). This storm is visible as a vortex—a whirlpool structure of winds rotating about a hollow cavity in which centrifugal forces produce a partial vacuum. As condensation occurs around the vortex, a pale cloud appears—the familiar and frightening tornado funnel. Funnels usually appear as an extension of the dark, heavy cumulonimbus clouds of thunderstorms, and stretch downward toward the ground. Some never reach the surface; others touch and rise again. Air surrounding the funnel is also part of the tornado vortex. As the storm moves along the ground, this outer ring of rotating winds becomes dark with dust and debris, which may eventually darken the entire funnel. These small, severe storms form several thousand feet above Earth's surface, usually during warm, humid, unsettled weather, and usually in conjunction with a severe thunderstorm. Sometimes a series of two or more tornadoes is associated with a parent thunderstorm. As the thunderstorm moves, tornadoes may form at intervals along its path, travel for a few miles, then dissipate. The forward speed of tornadoes has been observed to range from almost no motion to 70 mph. The winds of some tornadoes have been estimated to exceed 300 mph. Tornado formation requires the presence of layers of air with contrasting characteristics of temperature, moisture, density, and wind flow. Complicated energy transformations produce the tornado vortex. Many theories have been advanced as to the type of energy transformation necessary to generate a tornado, and none has won general acceptance. The two most frequently encountered theories visualize tornado generation as either the effect of thermally induced rotary circulations, or as the effect of converging rotary winds. Currently, scientists seem to agree that neither process generates tornadoes independently. It is more probable that tornadoes are produced by the combined effects of thermal and mechanical forces, with one or the other force being the stronger generating agent. Numerous observations of lightning strokes and a variety of luminous features in and around tornado funnels have led scientists to speculate about the relationship between tornado formation and thunderstorm electrification. This hypothesis explores the alternative possibilities that atmospheric electricity accelerates rotary winds to tornado velocities, or that those high-speed rotary winds generate large electrical charges. Here, as in most attempts to understand complex atmospheric relationships, the reach of theory exceeds the grasp of proof. Tornadoes vary greatly in size, intensity, and appearance. Most (69%) of the tornadoes that occur each year fall into the "weak" category. Wind speeds are in the range of 110 mph or less. Weak tornadoes account for less than 5% of all tornado deaths. About one out of every three tornadoes (29%) is classified as "strong." Strong tornadoes have wind speeds reaching about 205 mph, with an average path length of 9 mi, and a path width of 200 yd. Almost 30% of all tornado deaths occur each year from this type of storm. Nearly 70% of all tornado fatalities, however, result from "violent" tornadoes. Although very rare (only about 2% are violent), these extreme tornadoes can last for hours. Average path lengths and widths are 26 mi and 425 yd, respectively. The largest of these may exceed a mile or more in width, with wind speeds approaching 300 mph. Time of day during which tornadoes are most likely to occur is mid-afternoon, generally 3–7 P.M. , but they have occurred at all times of day. Length of path averages 4 mi, but may reach 300 mi. A tornado traveled 293 mi across Illinois and Indiana on May 26, 1917, and lasted seven hours and 20 minutes. Width of path averages about 300–400 yd but tornadoes have cut paths a mile or more in width. Speed of travel averages 25–40 mph, but speeds ranging from stationary to 68 mph have been reported. The cloud directly associated with a tornado is a dark, heavy cumulonimbus (the familiar thunderstorm cloud) from which a whirling funnel-shaped pendant extends to the ground. Precipitation associated with the tornado usually occurs first as rain just preceding the storm, frequently with hail, and as a heavy downpour immediately to the side of the tornado's path. Sound occurring during a tornado has been described as a roaring, rushing noise, closely approximating that made by a train speeding through a tunnel or over a trestle, or the roar of many airplanes. The intensity of tornadoes is defined according to the Fujita Scale (or F scale), which ranges from F0 to F6 as outlined below. F0: 40–72 mph winds. Damage is light and might include damage to tree branches, chimneys, and billboards. Shallow-rooted trees may be pushed over. F1: 73–112 mph winds. Damage is moderate; mobile homes may be pushed off foundations and moving autos pushed off the road. F2: 113–157 mph winds. Damage is considerable. Roofs can be torn off houses, mobile homes demolished, and large trees uprooted. F3: 158–206 mph winds. Damage is severe. Even well-constructed houses may be torn apart, trees uprooted, and cars lifted off the ground. F4: 207–260 mph winds. Damage is devastating. Houses can be leveled and cars thrown; objects become deadly missiles. F5: 261–318 mph winds. Damage is incredible. Structures are lifted off foundations and carried away; cars become missiles. Fewer than 2% of all tornadoes reach an intensity of this magnitude. F6: The maximum tornado wind speeds are not expected to exceed 318 mph. Tornadoes occur in many parts of the world and in all 50 states. But no area is more favorable to their formation than the continental plains of North America. The term "Tornado Alley" is sometimes used to identify this section of the United States—a section in which more tornadoes strike than in any other place in the world. This broad band begins in Texas and covers many states northward including Oklahoma, Missouri, Kansas, and Ohio. No season is free of these destructive storms. Normally, the number of tornadoes is at its lowest in the United States during December and January and at its (average) peak in May. The months of greatest total frequency are April, May, and June. In February, when tornado frequency begins to increase, the center of maximum frequency lies over the central Gulf states. Then, during March, this center moves eastward to the southeast Atlantic states, where tornado frequency reaches a peak in April. During May, the center of maximum frequency moves to the southern plains states, and in June, northward to the northern plains and Great Lakes area, as far east as western New York state. The reason for this drift is the increasing penetration of warm, moist air while contrasting cool, dry air still surges in from the north and northwest; tornadoes are generated with greatest frequency where these air masses wage their wars. Thus, when the Gulf states are substantially "occupied" by warm air systems after May, there is no cold air intrusion to speak of, and tornado frequency drops. This is the case across the nation after June, although in some states, a secondary tornado maximum occurs in the fall. Winter cooling permits fewer and fewer encounters between warm and overriding cold systems, and tornado frequency returns to its lowest level by December. The mathematical chance that a specific location will be struck by a tornado in any one year is quite small. For example, the probability of a tornado striking a given point in the area most frequently subject to tornadoes is 0.0363, or about once in 250 years. In the far western states, the probability is close to zero. But tornadoes have provided many un-mathematical exceptions. Oklahoma City, Oklahoma, has been struck by tornadoes 27 times since 1892. Baldwyn, Mississippi, was struck twice by tornadoes during a 25-minute period on March 16, 1942. One-third of Irving, Kansas, was left in ruins by two tornadoes that occurred 45 minutes apart on May 30, 1879. Austin, Texas, had two tornadoes in rapid succession on May 4, 1922; and Codell, Kansas, was struck three times in 1916, 1917, and 1918—all on May 20.
the annual average number of tornado days—days on which one or more tornadoes were reported—was 171. 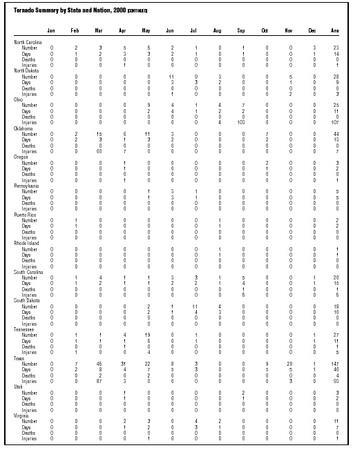 Average annual frequency by states for this period ranges from 129 tornadoes in Texas to fewer than three in most of the northeastern and far-western states. Tornadoes may occur at any hour of the day or night, but, because of the meteorological combinations which create them, they form most readily during the warmest hours of the day. The greatest number of tornadoes—82% of the total—occurs between noon and midnight, and the greatest single concentration—23% of the total tornado activity—falls between 4 and 6 P.M.
From 1916–52, fewer than 300 tornadoes were reported in any one year. 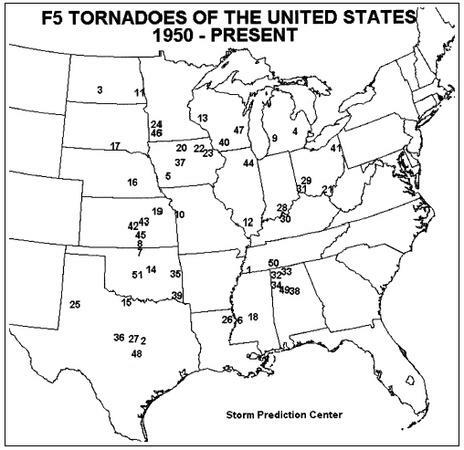 In 1953, when the U.S. Department of Commerce initiated its tornado forecasting effort, more than 421 tornadoes were observed and reported, beginning the first period of reliable statistical history. 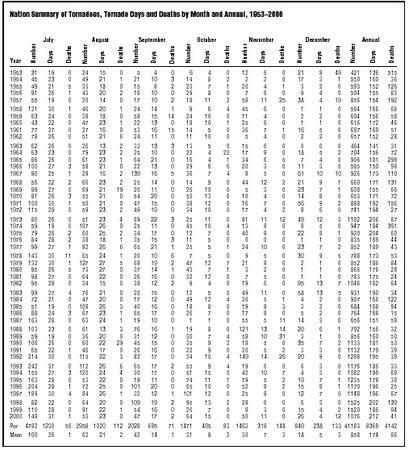 Since 1953, partly through improved equipment and techniques, partly through increasing public participation, essentially complete tornado records have been available. 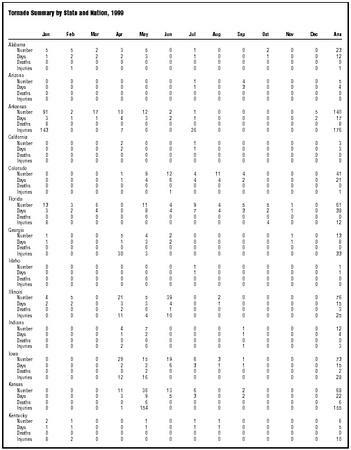 The average number of tornadoes from 1953 through 2001 is 859. For the past 30 years there has been an average of 996 per year. The explosion of reports of tornadoes in recent years is due to changes in the system, not climate change. 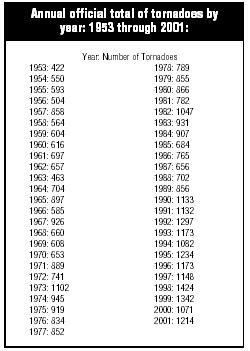 The average number of tornado days from 1953 through 2001 was 174. This number has also grown with time, but because it has an upper bound, the growth has been slower. The state that typically has the most tornadoes in a year is Texas: it's big and at the base of tornado alley. 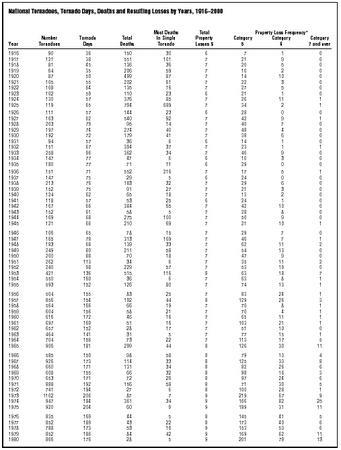 The annual Texas tornado count from 1953 through 2001 was 134. It ranged from 32 in 1953 to 232 in both 1967 and 1995. More tornadoes occurred in 1998, a total of 1,424, in the United States, than in any year from the beginning of firm records from 1916 to 2001. In 1992, 1,297 tornadoes struck in 44 states, killing 39 and causing property damage of $794 million. 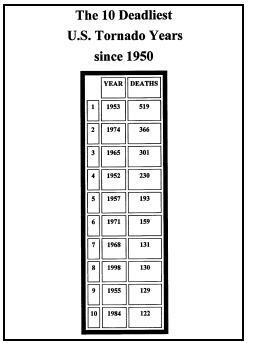 A harsher year for tornado deaths, however, was 1953 when 515 people died from 422 recorded tornadoes. The most death-dealing series of tornadoes on record occurred during the late afternoon on March 18, 1925, in portions of Missouri, Indiana, Illinois, Kentucky, and Tennessee. Eight separate and distinct tornadoes were observed. One of these killed 689 persons, injured 1,890 and caused more than $16 million in property damage. 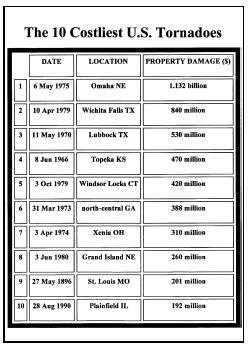 The other seven tornadoes of the series killed 740 and also caused significant property damage. Another major series of tornadoes killed 268 people and injured 1,874 in Alabama on March 21, 1932. Property damage amounted to approximately $5 million. 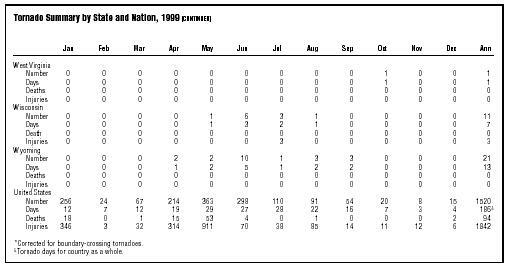 In March 1990, a series of four separate tornadoes occurred in central Kansas. Two of these tornadoes joined forces at one point and resulted in one of the three most intense to occur in the past decade. This series cut a path of over 100 mi in a two-and-one-half-hour period. The winds of another tornado in the Wichita, Kansas, area on April 26, 1991, reached 260 mph and traveled some 70 mi on the ground over a two-hour period. On March 1, 1997, a severe weather system, with tornadoes and extremely heavy rainfall, erupted along a nearly stationary front from Texas to West Virginia. By mid-afternoon, an outbreak of strong tornadoes in Arkansas, northern Mississippi, and western Tennessee resulted in 27 deaths, including 25 in Arkansas. Several of the tornadoes have been estimated at F4 intensity, with winds ranging from 207–260 mph. This was the deadliest U.S. outbreak since March 27, 1994, when 42 were killed in Alabama, Georgia, and South Carolina. Fortunately in this event, the National Weather Service (NWS) issued tornado warnings 10–32 minutes before the tornadoes struck, using NEXRAD radar to provide much more lead time than previously possible. During the late evening of February 22 and early morning of February 23, 1998, a series of tornadoes ripped across central Florida. At least one of the tornadoes reached an estimated F4 intensity. There were 42 fatalities; more than 3,500 residences were damaged, with more than 800 destroyed and another 700 left uninhabitable; and 135,000 utility customers lost power at the height of the storms. Damages from the tornado outbreak exceeded $60 million, and Florida's overall storm damage total was approximately $500 million. Hardest-hit locations in the tornado outbreak were Winter Garden, Altamonte Springs, Sanford, and Campbell. Overall, 54 of Florida's 67 counties were declared federal disaster areas due to storms over a period of months. In the late afternoon of Wednesday, April 8, 1998, severe thunderstorms quickly developed over Mississippi, Arkansas, and southwest Tennessee. During the evening, some of the more powerful storms generated tornadoes that caused massive property damage and loss of life along a path from northeast Mississippi through central Alabama into northern Georgia. Hardest hit were Jefferson and St. Clair Counties in the Birmingham, Alabama metropolitan area. In the wake of these storms, 36 people were killed, 273 were injured, and property damage was estimated at over $300 million. The path of destruction began about 6:30 P.M. CDT with one storm fatality in Pontotoc County, Mississippi, and ended near midnight with a death in De Kalb County, Georgia. The storms killed 34 people in Alabama—32 in Jefferson County and two in St. Clair County. 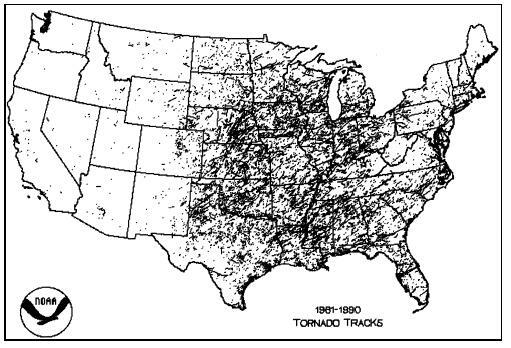 Some of the tornadoes produced tracks more than 30 mi long. The most intense tornado, an F5—one of the worst in Alabama history—moved through Jefferson County, destroying more than 1,000 permanent homes and damaging almost 1,000 more. There was widespread catastrophic damage in Jefferson County, caused by winds in excess of 260 mph and a damage path up to 0.75 mi wide. The affected counties were declared disaster areas and drew emergency responses from the Federal Emergency Management Agency (FEMA), U.S. Department of Labor, Small Business Administration, National Guard, Red Cross, numerous volunteers, and dozens of state and local agencies. Tornadoes occur every year, but what made this outbreak unique and deadly is that the tornadoes struck heavily populated areas. In Oklahoma and Kansas, 49 people were killed and another 898 injured as a result of the powerful storms. In Oklahoma, nearly 3,000 homes and 47 businesses were destroyed; in Kansas, estimates show that a total of 1,500 business and homes were destroyed. Insurance companies in Oklahoma City anticipated statewide damage claims of up to $750 million ($600 million of that in Oklahoma City alone). During the same week, heavy storms left paths of destruction in Tennessee, Texas, and Arkansas. There were 1,205 tornadoes observed in 1999, killing a total of 95 people. 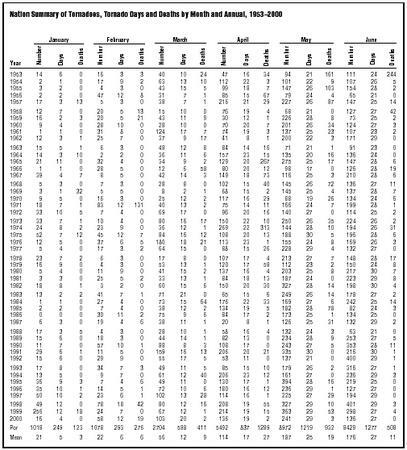 Figures show that there were fewer tornadoes in 2000 than average. Sixteen very strong to violent tornadoes (winds in excess of 158 mph) occurred between March and August 2000 in the United States. This is many fewer than the 1950–1999 average of 38. 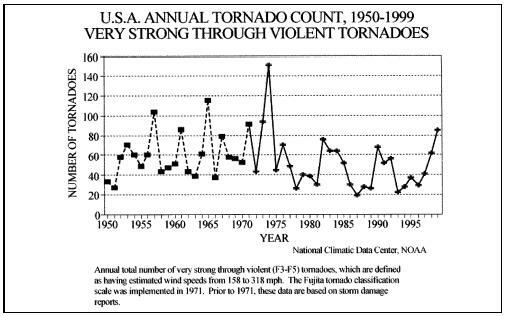 Throughout the past 50 years, little trend in very strong to violent tornado activity has been observed. A band of tornadoes pushed across Alabama in mid-December, killing at least 12 people. Hardest hit was the Tuscaloosa area. 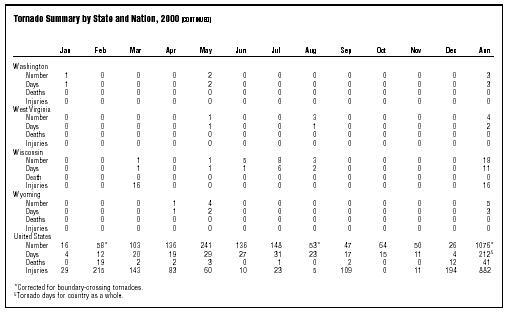 There were 1,071 observed tornadoes during 2000, killing 41 people. There were eight very-strong to violent tornadoes (wind speeds in excess of 158 mph, category F3 to F5) during the 2001 tornado season (March-August). 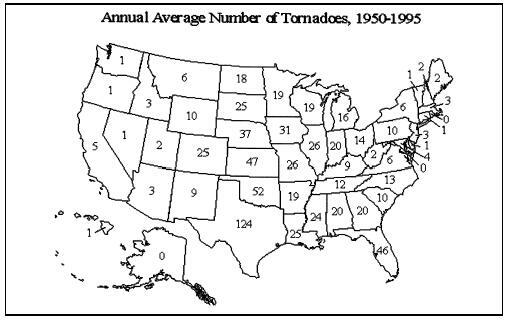 This is well below the long-term (1950–2000) mean of 38 and is the lowest such tornado count in the last 51 years. The previous record was nine violent tornadoes in 1987. 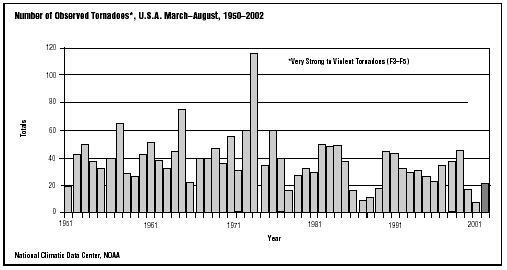 Little trend in very-strong to violent tornadoes has been observed since 1950. There were 1,214 observed tornadoes during 2001, killing 40 people. Prelim Final Prelim Final Final Final Avg. Prelim Final Final Final Avg. Prelim Final Final Final Avg. Note: ? means final number not available. Tennessee; 12 deaths in Alabama; 5 deaths in Ohio; and 1 death each in Mississippi and Pennsylvania. This outbreak occurred in November 2002. If there is some question as to the causes of tornadoes, there is none about the destructive effects of these violent storms. The dark funnel of a tornado can destroy solid buildings, make a deadly missile of a piece of straw, uproot large trees, and hurl people and animals for hundreds of yards. In 1931, a tornado in Minnesota carried an 83-ton railroad coach and its 117 passengers 80 ft through the air, and dropped them in a ditch. As a tornado passes over a building, the winds twist, lift, and rip at the outside and roof, which causes walls to collapse and topple, and windows to explode; the debris of this destruction is driven through the air in a dangerous barrage. Heavy objects like machinery and railroad cars are lifted and carried by the wind for considerable distances. Tornadoes do their destructive work through the combined action of their strong rotary winds and the impact of windborne debris. In the most simple case, the force of the tornado's winds pushes the windward wall of a building inward. The roof is lifted up and the other walls fall outward. Until recently, this damage pattern led to the incorrect belief that a structure explodes as a result of the atmospheric pressure drop associated with the tornado. Mobile homes are particularly vulnerable to strong winds and windborne debris; they should be evacuated for more substantial shelter when tornado warnings are in effect. The Federal Emergency Management Agency has produced an excellent publication, FEMA 320, August 1999, "Taking Shelter From the Storm; Building a Safe Room Inside Your House," which includes construction plans and cost estimates. Although it is not possible to predict exactly where and when severe thunderstorms and tornadoes will occur, it is possible to predict general areas where the probability of severe thunderstorm and tornado development is greatest by detecting the larger-scale events that are usually associated with such storms. Extensive damage reported . . . several homes destroyed. Twelve mobile homes destroyed and 1 home damaged. Extensive structural damage at Del Mar West Community College. Local sheriff reported 7 mobile homes damaged/destroyed. Fire department reported 8 mobile homes destroyed, large house and barn badly damaged. Heavy damage to businesses, high school and adjacent residential area. At least 15 hospitalized. Five homes destroyed . . . 1 mobile home with major damage. Several homes destroyed . . . a few automobiles totaled. Numerous buildings and homes destroyed. Tornado travelled 7 miles on the ground. Fatality associated with tree falling onto mobile home. Tornado hit Luck Lady trailer park and 3 homes east of trailer park. At least three frame homes and one mobile home destroyed. Number of residences destroyed. 84 yr. old woman thrown from mobile home. element of the National Oceanic and Atmospheric Administration (NOAA) of the U.S. Department of Commerce. Meteorologists at the Storm Prediction Center monitor conditions in the North American atmosphere, using surface data from hundreds of points and radar summaries, satellite photographs, meteorological upper-air profile (obtained by sounding balloons), and reports from pilots. From these thousands of pieces of information, meteorologists determine the area that is most likely to experience severe thunderstorms or tornadoes. Information on this area is then issued to NWS offices and the public in the form of a watch bulletin . In addition, trained civilian volunteers, "spotters," in the program SKYWARN, work with their local communities to alert the areas to dangerous weather. The spotters use their personal equipment and vehicles to provide the NWS with timely and accurate reports of severe weather. Once the severe conditions are confirmed by NWS radar, local authorities are contacted. A severe thunderstorm watch or tornado watch bulletin issued by the Center usually identifies an area about 140 mi wide by 240 mi long. Although the watch bulletin states approximately where and for how long the severe local storm threat will exist, it does not mean that severe local storms will not occur outside the watch area or time frame—the watch is only an indication of where and when the probabilities are highest. Watch bulletins are transmitted to all NWS offices. Designated offices prepare and issue a redefining statement, which specifies the affected area in terms of counties, towns, and locally well-known geographic landmarks. These messages are disseminated to the public by all possible means, and are used to guide the activities of local government, law enforcement, and emergency agencies in preparing for severe weather. Watches are not warnings . Until a severe thunderstorm or tornado warning is issued, persons in watch areas should maintain their normal routines, but watch for threatening weather and listen to the radio or television for further severe weather information. A severe thunderstorm warning or tornado warning bulletin is issued by a local office of the NWS when a severe thunderstorm or tornado has actually been sighted in the area or indicated by radar. Warnings describe the location of the severe thunderstorm or tornado at the time of detection, the area (usually the counties) that could be affected, and the time period (usually one hour) covered by the warning. The length of this area is equal to the distance the storm is expected to travel in one hour. When a warning is received, persons close to the storm should take cover immediately, especially in the case of a tornado warning. Persons farther away from the storm should be prepared to take cover if threatening conditions are sighted. Severe weather statements are prepared by local offices of the NWS to keep the public fully informed of all current information, particularly when watch or warning bulletins are in effect. Statements are issued at least once each hour, and more frequently when the severe weather situation is changing rapidly. In this way, a close watch is kept on weather developments, and information is quickly disseminated to the counties for which the NWS office has responsibility. In parts of the country where tornadoes are comparatively frequent, a form of shelter is vital for protection from tornadoes. The shelter may never be needed, but during a tornado emergency, it can be worth many times the effort and cost of preparing it. One of the safest tornado shelters is an underground excavation, known as a storm cellar. Location. When possible, the storm cellar should be located outside and near the residence, but not so close that failing walls or debris could block the exit. If there is a rise in the ground, the cellar may be dug into it to make use of the rise for protection. The cellar should not be connected in any way with house drains, cesspools, or sewer and gas pipes. Size. The size of the shelter depends on the number of persons to be accommodated and the storage needs. A structure 8 ft long by 6 ft wide and 7 ft high will protect eight people for a short time and provide limited storage space. Material. Reinforced concrete is the best material for a tornado shelter. Other suitable building materials include: split logs, 2-in planks (treated with creosote and covered with tar paper), cinder block, hollow tile, and brick. The roof should be covered with a 3-ft mound of well-pounded dirt, sloped to divert surface water. The entrance door should be of heavy construction, hinged to open inward. Drainage. The floor should slope to a drainage outlet if the terrain permits. If not, a dry well can be dug. An outside drain is better, because it will aid ventilation. Ventilation. A vertical ventilating shaft about 1 ft 2 can extend from near the floor level through the ceiling. This can be converted into an emergency escape hatch if the opening through the ceiling is made 2 ft 2 and the 1-ft shaft below is made easily removable. Slat gratings of heavy wood on the floor also will improve air circulation. Emergency equipment. A lantern and tools—crowbar, pick, shovel, hammer, pliers, screwdriver—should be stored in the cellar to ensure escape if cellar exits are blocked by debris. Stored metal tools should be greased to prevent rusting. All-clear bulletins are issued whenever the threat of severe thunderstorms or tornadoes has ended in the area previously warned in a tornado or severe thunderstorm warning bulletin. When a warning is canceled, but a watch continues in effect for the same area or a warning is in effect for an adjacent area, a Severe Weather Bulletin is issued. This qualified message is also issued when a portion, but not all, of a watch area is canceled. This permits a continuous alert in the path of the storm, with the alert being canceled as the severe weather moves through the watch area. The Verification of the Origins of Rotation in Tornadoes Experiment (VORTEX) was an experiment that began in 1994 and concluded in June 1995. The National Severe Storms Laboratory (NSSL) and the Center for the Analysis and Prediction of Storms (CAPS) sponsored it. Using a dozen instrumented vehicles, a mobile Doppler radar, and two Doppler-equipped aircraft, data were collected through a field program in parts of Texas, Oklahoma, and Kansas. It is hoped that the data collected from more than 30 storms will provide meteorologists with a better understanding of different elements of the tornado: the connection between mid-level and surface rotations of the storm, wind speed, and airflow patterns. With this knowledge meteorologists will be able to more accurately predict tornado formation, understand airflow patterns and wind speeds relevant to tornadic storms, advance the knowledge of the environment within a tornado—how it varies over time, pressure, humidity, and other tendencies—which can be used to comprehend how tornadoes cause damage. In the mid-1980s, the NSSL conducted tests to learn more about the internal workings of tornadoes by placing a 55-gal drum filled with sensors (called TOTO—TOtable Tornado Observatory) in the path of oncoming tornadoes. These efforts were met with minimal success. The 1996 movie Twister was based upon this work. A TORNADO WATCH means tornadoes are expected to develop. Keep a battery-operated radio or television set nearby, and listen for weather advisories—even if the sky is blue. A tornado warning means a tornado has actually been sighted or indicated by weather radar. Seek shelter inside a storm cellar or reinforced building and stay away from windows. Curl up so that your head and eyes are protected. Keep a battery-operated radio or television nearby, and listen for further advisories. ON THE STREET OR IN A CAR, leave your vehicle and take shelter in civil defense or other inside shelter areas with basements or storm cellars. Be sure to stay away from large glassed-in areas. If no building is available, or if caught out in the open countryside, take shelter in a ditch or ravine or lie flat on the ground upwind of your parked vehicle. IN HIGH-RISE OFFICE BUILDINGS AND LARGE APARTMENT BUILDINGS, if possible post a trained spotter or lookout on the roof with a two-way radio. Go to the lower floors or the basement. Take shelter in small interior rooms such as rest rooms, closets, and utility rooms as well as interior corridors. Be sure to cover and protect the head from flying and falling debris. IN HOMES, take shelter in the basement under sturdy items. Concrete laundry tubs, heavy-duty workbenches, pool tables, and staircases offer the greatest safety. If there is no basement, move to an interior bathroom or interior closet or, if necessary, an interior room or hallway on the lowest floor and take cover under heavily stuffed furniture in the center of the home. Take shelter away from all windows. Caution: Avoid bathrooms with an out-side wall or window. Also do not lock yourself in a closet that has no inside latch or door handle. IN SHOPPING CENTERS OR SHOPPING MALLS, if possible, post a trained security guard or lookout on the west or south side of the complex with a two-way radio. Take shelter in the basement or in shops. Be sure to protect your head from flying or falling debris. Caution: Avoid large open malls or walkways with glass or plastic skylights as well as large glass signs and display cases. IN SCHOOLS, go to a storm cellar or underground shelter if available. If there is no underground shelter area move the pupils into interior hallways or small interior rooms on the lowest floor. Caution: Avoid auditoriums, gymnasiums, and other large rooms with long free-span roofs as well as southwest-to-northeast-oriented corridors with exposed entrances on the south and west side of the building. Also avoid glass display cases, glassed-in stairwells and all doorways. IN FACTORIES, post a trained spotter or lookout on the roof with a two-way radio. Workers should move to sections of the plant that are below ground level. If this is not possible, have the workers take shelter in interior corridors or in small interior rooms such as rest rooms, closets, and storage rooms. Caution: Avoid large rooms or work areas with long free-span roofs. Stay away from all windows. IN MOBILE HOMES, leave your trailer and take shelter in an administration building with a basement or an approved community shelter area. If no shelter is available, go to a ditch or ravine and lie down flat against the ground. Make sure you protect your head from flying debris. In 1998, a team of government and university scientists based at NOAA's National Severe Storms Laboratory and the University of Oklahoma in Norman, Oklahoma, began using mobile meteorological stations and truck-mounted radars in an attempt to intercept severe storms in the Great Plains to get close-up observations of a developing tornado. The radar data and other information collected attempt to offer researchers a three-dimensional view of the complete life cycle of a tornado and ultimately help improve NOAA forecasts and warnings of severe weather. The research is a follow-up to the VORTEX project of 1994 and 1995, in which scientists from NOAA, the University of Oklahoma, and other universities intercepted and studied 10 tornadoes from as close as 3 mi away; and 1997's SubVORTEX, in which the team intercepted a tornado for the first time using truck-mounted radar dishes called "Doppler on Wheels" or DOWs. Using three DOWs and six sedans equipped with meteorological sensors, cameras, and communications gear, the scientists attempt to target a supercell—a large thunderstorm with a rotating updraft. When a likely storm system is forecast, the team sets out to intercept the supercell and position two 8-ft-diameter DOWs about a mile outside the storm to scan the entire area of rotating air every 30–90 seconds. Other team members use a third, shorter wavelength DOW to make finer-scale measurements. The team then attempts to send one or more of the three instrumented "probe" vehicles inside the hook —the rotating center of the supercell that looks like an inverted question mark in radar images and often signals a tornado is about to form. One of the team's experiments, conducted in spring 1998, called SubVORTEX-RFD, attempted to photograph and measure the rear flank downdraft of winds of a super-cell, since the scientists believe this is the region of a storm that often triggers a tornado. The scientists document the origin and evolution of the storm's rear flank downdraft by measuring variations in these winds just before and after a tornado forms. To do this, the team carefully positions some of the probe vehicles beneath the most strongly rotating part of the storm, something that has never been done before. Another experiment, called Radar Observations of Tornadoes and Thunderstorms (ROTATE), uses the dual-DOW network in an attempt to study the whole tornado genesis process, tornado maintenance, tornado death, and tornado structure. 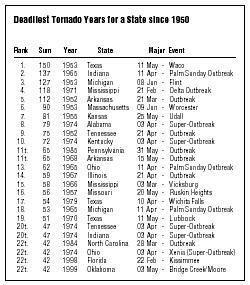 Severe weather experts from NOAA's Storm Prediction Center in Norman, Oklahoma, have prepared a list of some of the more notable tornado outbreaks that occurred in the United States during the twentieth century. The summary lists the tornadoes by decade and notes the technological and policy improvements that resulted. "For meteorologists who study tornadic storms either through forecasting or research or storm chasing, there are a number of memorable tornadoes or tornado outbreaks during the 1900s," says Dan McCarthy, warning coordination meteorologist for the Storm Prediction Center. "Many meteorologists are in the profession because of a certain out-break or tornado that spurred their curiosity, driving them to the science." Technological advancements in the second half of the century have contributed to better, more accurate severe weather watches and warnings from the National Weather Service, ultimately saving countless lives. The biggest advancement for severe weather forecasting was the development of Doppler radar. NOAA scientists and other researchers took the airborne radar developed by the U.S. military during World War II and applied it to weather fore-casting and severe storm identification. The ultimate result was the Next Generation Radar (NEXRAD) Doppler weather radar system currently in use. Developments in computer technology also have created continued advancements in numerical weather prediction, allowing meteorologists to apply physics in replicating motions of the atmosphere. This, combined with diligent analysis to recognize weather patterns, helped advance severe weather prediction to its current level of an average lead time of over 11 minutes for tornado warnings issued by National Weather Service forecasters. The most impressive and devastating tornado outbreak in the twentieth century was the Super Outbreak of April 3–4, 1974. The outbreak lasted 16 hours and produced a total of 148 tornadoes across 13 states from Illinois, Indiana, and Michigan southward through the Ohio and Tennessee Valleys into Mississippi, Alabama, and Georgia. This outbreak produced more long-track tornadoes than any other, killing 315 people and injuring more than 5,000. The most notable individual tornado was the one that moved into Xenia, Ohio, just before 4:30 P.M. It destroyed much of the town, including the town square and high school, killing 34 people. 1900–1909: The outbreak of April 24–26, 1908, included violent tornadoes that moved through parts of Louisiana, Mississippi, and Alabama, killing 324 people and injuring 1,652 others. The worst damage took place in Amite, Louisiana, where 29 people died. 1910–1919: A long-track tornado on May 26, 1917, traveled across Illinois and Indiana for 293 miles, lasting seven hours and 20 minutes. The tornado killed 101 people and injured 638 others. Another tornado moved through the town of Mattoon, Illinois, destroying everything in a two-and-a half block-wide path for 2.5 mi. 1920–1929: The Tri-State tornado of March 18, 1925, developed near Ellington, Missouri, and then for the next 3.5 hours killed more people and destroyed more schools, homes, and farmsteads than any other tornado to this point in history. The tornado cut across southern Illinois into southern Indiana, killing 695 people, 234 of them in the town of Murphysboro, Illinois, and injuring 2,027. Other tornadoes occurred in Kentucky, Tennessee, and Alabama. A total of nine tornadoes were reported, leaving 747 dead and nearly 2,300 people injured. 1930–1939: On March 21–22, 1932, a total of 330 people died as a result of tornadoes that touched down across northern Alabama. One tornado hit the northeast part of the state, killing 38 and injuring 500. During the Tupelo/Gainesville outbreak on April 5–6, 1936, 17 tornadoes were scattered across parts of northern Mississippi and northern Georgia. A massive pair of tornadoes hit Gainesville, Georgia, in the morning, killing 203 people and causing 1,600 injuries. 1940–1949: Three major outbreaks occurred during this decade. The first, on March 16, 1942, left 152 dead and 1,284 injured from tornadoes that raked across parts of Illinois, Mississippi, Tennessee, and Kentucky. As many as 63 people perished in a tornado northwest of Greenwood, Mississippi, that hit as buses carried school children home. Five hundred people were injured. A total of 154 people died and nearly 1,000 were injured on June 23, 1944, as tornadoes struck parts of Ohio, Pennsylvania, West Virginia, Maryland, and Delaware. The worst areas affected were parts of northeast West Virginia and western Maryland, where a tornado family killed 30 and injured 300. On April 9, 1947, a tornado outbreak that included eight tornadoes raked across parts of Texas, Oklahoma, and Kansas. One tornado killed 107 people in Woodward, Oklahoma. Devastation covered 100 city blocks and 1,000 homes were damaged or destroyed. Cost of the damage at that time was estimated at $6 million. Clean-up afterward was hampered by cold and snow. 1950–1959: On May 11, 1953, a violent tornado hit downtown Waco, Texas, killing 114 people and destroying about 200 business buildings. Heaps of bricks up to five feet high filled the streets. Survivors were buried for up to 14 hours. A tornado outbreak in early June 1953 produced two major tornadoes. On June 8, a tornado hit in Flint, Michigan, leaving 116 people dead. The next day, June 9, a tornado described as "a huge cone of black smoke" carrying debris eastward over the Boston area and out over the Atlantic Ocean caused 94 deaths and nearly 1,300 injuries in Worcester, Massachusetts. In the United States, the death toll was 116 from tornadoes in Michigan, Ohio, Massachusetts, and New Hampshire. Other tornadoes occurred in Canada. The hardest-hit area from a tornado outbreak in Oklahoma and Kansas on May 25, 1955, was Udall, Kansas. Eighty people were known dead and 270 were injured—more than half of the people in Udall—and the town was destroyed. For the entire outbreak, tornadoes killed 102 people and injured 563. A tornado moved across southeast parts of Kansas City hitting the area of Ruskin Heights on May 20, 1957. Forty-four people were killed and 531 were injured. More than 825 homes and businesses were damaged or destroyed, including the local high school. The outbreak itself spread from northeast Kansas and northeast Oklahoma through Missouri into Iowa and Illinois. In all, 17 tornadoes killed 59 people and injured 665 others. 1960–1969: The second most damaging outbreak of the century, known as the Palm Sunday outbreak, occurred April 11–12, 1965. Nearly 50 tornadoes struck parts of the Great Lakes region from Wisconsin and Illinois eastward through lower Michigan and northern Ohio. The outbreak resulted in 256 deaths and 3,402 injuries. Twin tornadoes moved into Goshen, Indiana, destroying nearly 100 trailer homes. A large tornado hit Russiaville, Indiana, damaging or destroying 90% of the buildings. As many as 44 people died and 612 were injured as one tornado followed another tornado across Steuben County in northern Indiana and Monroe County and others in lower Michigan. Tornadoes devastated areas in northern Toledo, Ohio, killing 18 people. Other tornadoes moved through areas about 15 miles southwest of Cleveland just northeast of Strongsville. Six homes literally vanished; 18 people were killed and 200 others were injured. On June 8, 1966, a tornado brought massive damage to Topeka, Kansas, causing $100 million in damage. This became the most expensive tornado to date. 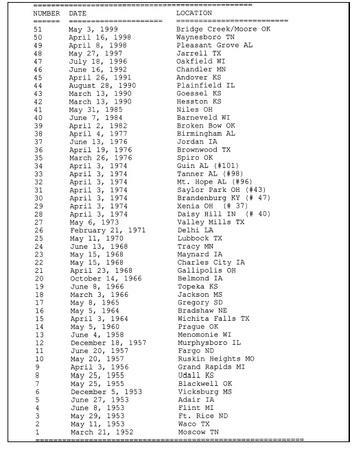 1970–1979: The most prolific tornado outbreak of the twentieth century was the Super Outbreak of April 3–4, 1974. During a 16-hour period, 148 tornadoes occurred from Illinois and Indiana into Michigan and Ohio southward through the Tennessee Valley into Mississippi and Alabama. This outbreak produced the largest number of tornadoes, with 30 causing F4 damage or worse. On one occasion, as many as five large tornadoes were on the ground at one time. The outbreak killed 315 people and resulted in 6,142 injuries. One tornado hit Xenia, Ohio, at 4:30 P.M. , moved through the center of town and demolished the high school. Thirty-four people died and 1,150 were injured in Xenia as 300 homes were destroyed and 2,100 homes were damaged. Five years later, a tornado hit Wichita Falls, Texas, on April 10, 1979, killing 42 people and injuring 1,740. 1980–1989: Thirty tornadoes spread out across parts of northeast Ohio into western Pennsylvania on May 31, 1985. The outbreak killed 76 people and injured 876 others. Twelve people died from one tornado that moved from Ashtabula County, Ohio, into Erie County, Pennsylvania. Sixteen people were killed by a tornado that started over Trumbull County, Ohio, then moved east/northeast across parts of Pennsylvania. Another outbreak moved across Iowa and Minnesota into Wisconsin on June 7–8, 1984. The town of Barneveld, Wisconsin, was hit by a tornado just before midnight. Everything but the water tower was demolished and nine people were killed. As many as 45 tornadoes in the entire outbreak killed 13 people. 1990–1999: The role of videotape and the advances in media technology provided many breathtaking views of tornadoes in the 1990s. People came from miles around to film the Hesston, Kansas tornado on March 13, 1990. One tornado started near Goshen, only to merge with a second near Hesston and track northeast to just southwest of Topeka, Kansas. Another notable Palm Sunday tornado occurred on March 27, 1994, when 22 people died in Goshen, Alabama, after a tornado hit a church. Most recently, a large tornado mowed through areas of southwest Oklahoma City and Moore, Oklahoma, on May 3, 1999, demolishing or damaging more than 8,000 homes and ringing up more than $1 billion in damage. This tornado was part of an outbreak of 74 tornadoes that affected parts of Oklahoma and southern Kansas, killing 48 people. Advancements in communications through radio and television helped issue advanced watches and warnings to the public. Additionally, meteorological advancements from research in storm structure using Doppler radar helped fore-casters identify tornadic storms, improving warnings from a few minutes to as many as 20 minutes and increasing public response. Does hail always come before a tornado? Rain? Lightning? Utter silence? None of these necessarily come before a tornado. Rain, wind, lightning, and hail characteristics vary from storm to storm, from one hour to the next, and even with the direction the storm is moving with respect to the observer. While large hail can indicate the presence of an unusually dangerous thunderstorm, and can happen before a tornado, do not depend on it. Hail, or any particular pattern of rain, lightning or calmness, is not a reliable predictor of tornado threat. That depends on what it is hitting, its size, intensity, closeness, and other factors. The most common tornado sound is a continuous rumble, like a close-by train. Sometimes a tornado produces a loud whooshing sound, like that of a waterfall or of open car windows while driving very fast. Tornadoes that are tearing through densely populated areas may produce all kinds of loud noises at once, which collectively may make a tremendous roar. Just because you may have heard a loud roar during a damaging storm does not necessarily mean it was a tornado. Any intense thunderstorm wind can produce damage and cause a roar. The details are still debated by tornado scientists. We do know tornadoes need a source of instability (heat, moisture, etc.) and a larger-scale property of rotation (vorticity) to keep going. There are a lot of processes around a thunderstorm that can possibly rob the area around a tornado of either instability or vorticity. One is relatively cold outflow—the flow of wind out of the precipitation area of a shower or thunderstorm. Many tornadoes have been observed to go away soon after being hit by outflow. For decades, storm observers have documented the death of numerous tornadoes when their parent circulations (mesocyclones) weaken after they become wrapped in outflow air—either from the same thunderstorm or a different one. The irony is that some kinds of thunderstorm outflow may help to cause tornadoes, while other forms of outflow may kill tornadoes. No. There is no such thing as a "skipping" tornado, despite what you may have read in many older references, news stories, or even damage survey reports. By definition (above), a tornado must be in contact with the ground. When the vortex is not, it is literally no longer a tornado; and even if the same vortex or funnel cloud makes ground contact later, it is a separate tornado. Stories of skipping tornadoes usually mean either (1) there was continuous contact between vortex and ground in the path, but it was too weak to do damage; (2) multiple tornadoes occurred, but there was no survey done to precisely separate their paths (very common before the 1970s); or (3) there were multiple tornadoes with only short separation, but the survey erroneously classified them as one tornado. Is a low-hanging cloud in a thunderstorm a tornado? Many low-hanging clouds are not tornadoes, but sometimes are wrongly reported as tornadoes anyway. The most important things to look for when you see a suspicious cloud feature are: (1) rapid cloud-base rotation, if you are close enough to make out cloud movement, and (2) a concentrated, whirling debris or dust cloud at ground level under the thunderstorm base. (Imagine this spinning rapidly.) It is common to have one without the other. Many thunderstorms produce dust plumes in their outflow; these tend to move in one direction and not rotate. In gustnadoes there is spinning motion at ground level but not at cloud base (therefore, not a tornado). If the ground is wet enough, or the circulation weak enough, there may not be any debris under a rotating cloud base. But persistent rotation in the cloud base is potentially very dangerous and should be reported. At night, also look for persistent cloud lowering to ground, especially if accompanied by a power flash. What is the difference between a funnel cloud and a tornado? What is a funnel cloud? In a tornado, damaging circulation is on the ground—whether or not the cloud is. A true funnel cloud rotates, but has no ground contact or debris, and does no damage. If it is a low-hanging cloud with no rotation, it is not a funnel cloud. Caution: tornadoes can occur without a funnel, and what looks like "only" a funnel cloud may be doing damage that cannot be seen from a distance. Because it may quickly become a tornado, any funnel cloud (remember rotation!) should be reported by spotters. Why are some tornadoes white, and others black, gray, or even red? Tornadoes tend to look darkest when one looks southwest through northwest in the afternoon. In those cases, they are often silhouetted in front of a light source, such as brighter skies west of the thunderstorm. If there is heavy precipitation behind the tornado, it may be dark gray, blue, or even white—depending on where most of the daylight is coming from. This happens often when the spotter is looking north or east at a tornado, and part of the forward-flank and/or rear-flank cores. Tornadoes wrapped in rain may exhibit varieties of gray shades on gray, if they are visible at all. Lower parts of tornadoes also can assume the color of the dust and debris they are generating; for example, a tornado passing across dry fields in western or central Oklahoma may take on the hue of the red soil so prevalent there. What is a "wedge" tornado? A "rope" tornado? These are slang terms often used by storm observers to describe tornado shape and appearance. Remember, the size or shape of a tornado does not say anything certain about its strength! "Wedge" tornadoes simply appear to be at least as wide as they are tall (from ground to ambient cloud base). "Rope" tornadoes are very narrow, often sinuous or snakelike in form. Tornadoes often (but not always!) assume the "rope" shape in their last stage of life; and the cloud rope may even break up into segments. Again, tornado shape and size do not signal strength! Some rope tornadoes can still do violent damage of F4 or F5. What is a multivortex tornado? Multivortex (a.k.a. multiple-vortex) tornadoes contain two or more small, intense subvortices orbiting the center of the larger tornado circulation. When tornadoes do not contain too much dust and debris, they can sometimes be spectacularly visible. These vortices may form and die within a few seconds, sometimes appearing to train through the same part of the tornado one after another. They can happen in all sorts of tornado sizes, from huge "wedge" tornadoes to narrow "rope" tornadoes. Subvortices are the cause of most of the narrow, short, extreme swaths of damage that sometimes arc through tornado tracks. From the air, they can preferentially mow down crops and stack the stubble, leaving cycloidal marks in fields. Multivortex tornadoes are the source of most of the old stories from newspapers and other media before the late twentieth century that told of several tornadoes seen together at once. What is a "satellite" tornado? Is it a kind of multivortex tornado? No. There are important distinctions between satellite and multiple-vortex tornadoes. A satellite tornado develops independently from the primary tornado—not inside it as does a suction vortex. The tornadoes remain separate and distinct as the satellite tornado orbits its much larger companion within the same mesocyclone. Their cause is unknown; but they seem to form most often in the vicinity of exceptionally large and intense tornadoes. A gustnado is a small and usually weak whirlwind that forms as an eddy in thunderstorm outflows. They do not connect with any cloud-base rotation and are not tornadoes. But because gustnadoes often have a spinning dust cloud at ground level, they are sometimes wrongly reported as tornadoes. Gustnadoes can do minor damage (e.g., break windows and tree limbs, overturn trash cans, and toss lawn furniture), and should be avoided. This is storm-chaser slang for a non-supercell tornado. So-called "landspouts" resemble waterspouts in that way, and also in their typically small size and weakness compared to the most intense tornadoes. But "landspouts" are tornadoes by definition; they are capable of doing significant damage and killing people. A waterspout is a tornado over water—usually meaning non-supercell tornadoes over water. Waterspouts are common along the southeast U.S. coast—especially off southern Florida and the Keys—and can happen over seas, bays, and lakes worldwide. Although waterspouts are always tornadoes by definition; they do not officially count in tornado records unless they hit land. They are smaller and weaker than the most intense Great Plains tornadoes, but still can be quite dangerous. Waterspouts can overturn small boats, damage ships, do significant damage when hitting land, and kill people. The National Weather Service will often issue special marine warnings when waterspouts are likely or have been sighted over coastal waters, or tornado warnings when waterspouts can move onshore. How are tornadoes in the Northern Hemisphere different from tornadoes in the Southern Hemisphere? 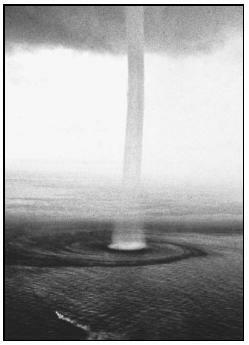 Most waterspouts in the United States form in the Florida Keys area, although they may occur over inland bodies of water. in the Northern Hemisphere and clockwise south of the equator. Anticyclonic tornadoes (clockwise-spinning in the Northern Hemisphere) have been observed, however—usually in the form of waterspouts, non-supercell land tornadoes, or anticyclonic whirls around the rim of a supercell's mesocyclone. There have been several documented cases of cyclonic and anticyclonic tornadoes under the same thunderstorm at the same time. Anticyclonically rotating supercells with tornadoes are extremely rare; but one struck near Sunnyvale, California, in 1998. Remember, "cyclonic" tornadoes spin counter-clockwise in the Northern Hemisphere, and clockwise in the Southern Hemisphere. How many tornadoes hit the United States yearly? About 1,000. The actual average is unknown, because tornado spotting and reporting methods have changed so much in the last several decades that the officially recorded tornado climatologies are believed to be incomplete. Also, in the course of recording thousands of tornadoes, errors are bound to occur. Events can be missed or misclassified; and some nondamaging tornadoes in remote areas could still be unreported. Tornado Alley is a nickname in the popular media for a broad swath of relatively high tornado occurrence in the central United States. Various Tornado Alley maps that you may see can look different because tornado occurrence can be measured many ways—by all tornadoes, tornado county-segments, strong and violent tornadoes only, and databases with different time periods. Remember, this is only a map of greatest incidence. Violent or killer tornadoes do happen outside this Tornado Alley every year. Tornadoes can occur almost anywhere in the United States, and even overseas. What city has been hit by the most tornadoes? Oklahoma City. 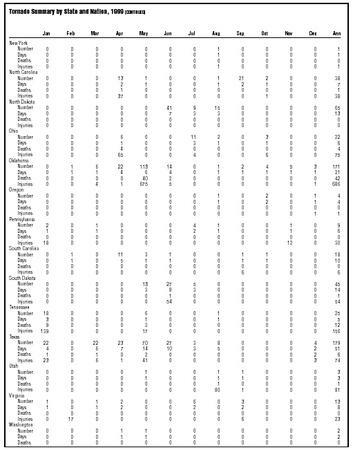 The exact count varies because city limits and tornado reporting practices have changed over the years; but the known total is now over 100. Some towns have legends that they are protected from tornadoes by a hill, river, spirit, etc. Is there any truth to this? No. Many towns that have not suffered a tornado strike contain well-meaning people who perpetuate these myths; but there is no basis for them besides the happenstance lack of a tornado. Many other towns used to have such myths before they were hit, including extreme examples like Topeka, Kansas (F5 damage, 16 killed, 1968) and Waco, Texas (F5 damage, 114 killed, 1953). Violent tornadoes have crossed rivers of all shapes and sizes. The deadliest tornado in U.S. history (Tri-state Tornado of March 18, 1925; F5 damage; 695 killed) roared undeterred across the Mississippi River, as have numerous other violent tornadoes. Almost every major river east of the Rockies has been crossed by a significant tornado, as have high elevations in the Appalachians and Rockies. The highest elevation a tornado has ever occurred is unknown; but it is at least 10,000 ft above sea level. On July 21, 1987, there was a violent (F4 damage) tornado in the Tetons of Wyoming near that elevation; and there have probably been lesser ones at higher altitudes. On August 31, 2000, a supercell spawned a photogenic tornado in Nevada. Tornadoes are generally a lot less frequent west of the Rockies per unit area with a couple of exceptions. One exception is the Los Angeles Basin, where weak-tornado frequency over tens of square miles is on par with that in the Great Plains. Elsewhere, there are probably more high-elevation western tornadoes occurring than we have known about, just because many areas are so sparsely populated, and lack the density of spotters and storm chasers we have in the Plains. Why does it seem that tornadoes avoid downtowns of major cities? Simply, downtowns cover such tiny land areas relative to the entire nation. The chance of any particular tornado hitting a major downtown is quite low—not for any meteorological reason, but simply because downtowns are small targets. Even when tornadoes hit metro areas; their odds of hitting downtown are small. For example, downtown Dallas (inside the freeway loop) covers roughly three square miles—Dallas County, about 900 square miles. For a brief tornado in Dallas County, its odds of hitting downtown are only about one in 300. Still, downtown tornadoes have happened, including at least four hits on St. Louis alone. The idea of large buildings destroying or preventing a tornado is pure myth. Even the largest skyscrapers pale in size and volume when compared to the total circulation of a big tornado from ground through thunderhead. 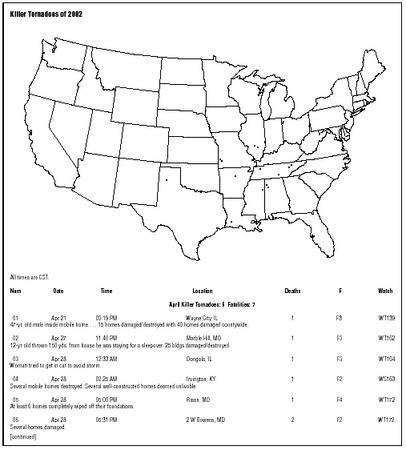 What is the risk of another super-outbreak like April 3–4, 1974? It is rare; but we do not know how rare, because an out-break like that has only happened once since tornado records have been kept. There is no way to know if the odds are one in every 50 years, 100 years, or 1,000 years, since we just do not have the long climatology of reasonably accurate tornado numbers to use. So the bigger the outbreaks, the less reliably we can judge their potential to recur. What are the chances of a tornado near my house? The frequency that a tornado can hit any particular square mile of land is about every 1,000 years on average—but varies around the country. The reason this is not an exact number is because we do not have a long and accurate enough record of tornadoes to make more certain (statistically sound) calculations. The probability of any tornado hitting within sight of a spot (let's say 25 nautical miles) also varies during the year and across the country. Dr. T. Theodore Fujita developed a damage scale for winds, including tornadoes, that is supposed to relate the degree of damage to the intensity of the wind. This scale was the result. The F-scale should be used with great caution. 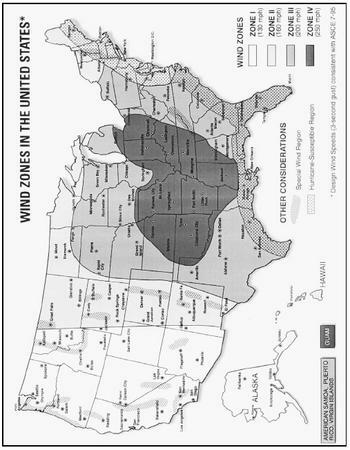 Tornado wind speeds are still largely unknown; and the wind speeds on the F-scale have never been scientifically tested and proven. Different winds may be needed to cause the same damage depending on how well built a structure is, wind direction, wind duration, battering by flying debris, and many other factors. Also, the process of rating the damage itself is largely a judgment call—quite inconsistent and arbitrary. Even meteorologists and engineers highly experienced in damage survey techniques may come up with different F-scale ratings for the same damage. Even with all its flaws, the F-scale is the only widely used tornado rating method, and probably will remain so until ground-level winds can be measured in most tornadoes. So if the F-scale winds are just guesses, why are they so specific? Those winds were arbitrarily attached to the damage scale based on 12-step mathematical interpolation between the hurricane criteria of the Beaufort wind scale and the threshold for Mach 1 (738 mph). Though the F-scale actually peaks at F12 (Mach 1), only F1 through F5 are used in practice, with F0 attached for tornadoes of winds weaker than hurricane force. Again, F-scale wind-to-damage relationships are untested, unknown, and purely hypothetical. They have never been proven and may not represent real tornadoes. F-scale winds should not be taken literally. It was noted that the Oklahoma City tornado was "almost F6." Is that a real level on the scale? Only in untested theory. Fujita plotted hypothetical winds higher than F5; but as mentioned in the previous answer above, they were only guesses. Even if winds measured by portable Doppler radar (slightly above ground level) had been over 318 mph, the tornado would still be rated "only" F5 since F5 is the most intense possible damage level. What is a "significant" tornado? A tornado is classified as "significant" if it does F2 or greater damage on the F scale. It is important to know that those definitions are arbitrary, and exist for scientific research. No tornado is necessarily insignificant. Any tornado can kill or cause damage; and some tornadoes rated less than F2 probably could do F2 or greater damage if they hit a well-built house during peak intensity. Big fat tornadoes are the strongest ones, right? Not necessarily. The size or shape of a tornado does not say anything about its strength! Some small "rope" tornadoes can still do violent damage of F4 or F5; and some very large tornadoes over a quarter-mile wide have produced only weak damage of F0 to F1. What was the strongest tornado? What is the highest wind speed in a tornado? Nobody knows. Tornado wind speeds have only been directly recorded in the weaker ones, because strong and violent tornadoes destroy weather instruments. Mobile Doppler radars such as the University of Oklahoma's Doppler on Wheels have remotely sensed tornado wind speeds above ground level as high as 318 mph (May 3, 1999 near Bridge Creek, Oklahoma)—the highest winds ever found near Earth's surface by any means. (That tornado caused F5 damage.) But ground-level wind speeds in the most violent tornadoes have never been directly measured. Does El Niño cause tornadoes? No. Neither does La Niña. Both are major changes in sea surface temperature in the tropical Pacific, which occur over the span of months. U.S. tornadoes happen thousands of miles away on the order of seconds and minutes. El Niño does adjust large-scale weather patterns. But there are too many variables to say conclusively what role El Niño (or La Niña) has in changing tornado risk; and it certainly does not directly cause tornadoes. A few studies have shown some loose associations between El Niño years and regional trends in tornado numbers from year to year; but that still does not prove cause and effect. Weak associations by year may be as close as the El Niño-to-tornado connection can get—because there are so many things on the scales of states, counties, and individual thunderstorms that affect tornado formation. How does cloud seeding affect tornadoes? Nobody knows for certain. There is no proof that seeding can or cannot change tornado potential in a thunderstorm. This is because there is no way to know that the things a thunderstorm does after seeding would not have happened anyway. This includes any presence or lack of rain, hail, wind gusts, or tornadoes. Because the effects of seeding are impossible to prove or disprove, there is a great deal of controversy in meteorology about whether it works, and if so, under what conditions, and to what extent. Do hurricanes and tropical storms produce tornadoes? Often, but not always. There are great differences from storm to storm, not necessarily related to tropical cyclone size or intensity. Some landfalling hurricanes in the United States fail to produce any known tornadoes, while others cause major outbreaks. Though fewer tornadoes tend to occur with tropical depressions and tropical storms than with hurricanes, there are notable exceptions like TS Beryl in the Carolinas in 1994. Relatively weak hurricanes like Danny (1985) have spawned significant supercell tornadoes well inland, as have larger, more intense storms like Allen (1980) and Beulah (1967). Hurricane Beulah, in fact, caused the second biggest tornado outbreak on record in numbers, with 115. Hurricane-spawned tornadoes tend to occur in small, low-topped supercells within the outer bands, NNW through ESE of the center—mainly the northeast quadrant. There, the orientation and speed of the winds create vertical shear profiles somewhat resembling those around classic Great Plains supercells—but weaker and shallower. Because tornado-producing circulations in hurricane supercells tend to be smaller and shorter-lived than their Midwest counterparts, they are harder to detect on Doppler radar, and more difficult to warn for. But hurricane-spawned tornadoes can still be quite deadly and destructive, as shown by the F3 tornado from Hurricane Andrew at La Place, Louisiana (1992, 2 killed) and an F4 tornado at Galveston, Texas from Hurricane Carla (1961, 8 killed). We do not know how many tornadoes hurricanes produce over the water. But the similarity in Doppler radar velocity signatures over water to tornado-producing cells in landfalling hurricanes suggests that it does happen—and that they can be yet another good reason for ships to steer well clear of tropical cyclones. Only the National Weather Service (NWS) issues tornado forecasts nationwide. Warnings come from a local NWS office. The Storm Prediction Center (SPC) issues watches, general severe weather outlooks, and mesoscale discussions. This is a very simple question with no simple answer! Here is a very generalized view from the perspective of a severe weather forecaster: when predicting severe weather (including tornadoes) a day or two in advance, we look for the development of temperature and wind flow patterns in the atmosphere that can cause enough moisture, instability, lift, and wind shear for tornadic thunderstorms. Those are the four needed ingredients. But it is not as easy as it sounds. "How much is enough" of those is not a hard and fast number, but varies a lot from situation to situation—and sometimes is unknown! A large variety of weather patterns can lead to tornadoes; and often, similar patterns may produce no severe weather at all. To further complicate it, the various computer models we use days in advance can have major biases and flaws when the forecaster tries to interpret them on the scale of thunderstorms. As the event gets closer, the forecast usually (but not always) loses some uncertainty and narrows down to a more precise threat area. (At SPC, this is the transition from outlook to mesoscale discussion to watch.) Real-time weather observations—from satellites, weather stations, balloon packages, airplanes, wind profilers, and radar-derived winds—become more and more critical the sooner the thunderstorms are expected; and the models become less important. To figure out where the thunderstorms will form, we must do some hard, short-fuse detective work: find out the location, strength and movement of the fronts, drylines, outflows, and other boundaries between air masses that tend to provide lift. Figure out the moisture and temperatures—both near ground and aloft— that will help storms form and stay alive in this situation. Find the wind structures in the atmosphere that can make a thunderstorm rotate as a supercell, then produce tornadoes. (Many supercells never spawn a tornado!) Make an educated guess where the most favorable combination of ingredients will be and when; then draw the areas and type the forecast. 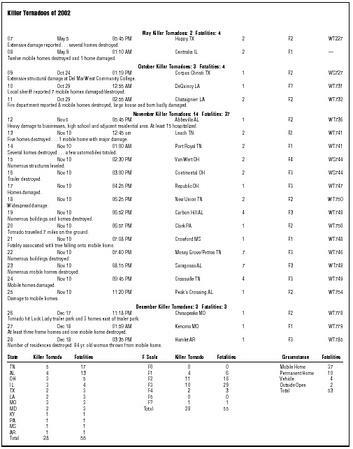 How is tornado damage rated? The most widely used method worldwide is the F-scale. In Britain, there is a similar scale with more divisions. In both cases, the wind speeds are based on calculations of the Beaufort wind scale and have never been scientifically verified in real tornadoes. Because (1) nobody knows the "true" wind speeds at ground level in most tornadoes, and (2) the amount of wind needed to do similar-looking damage can vary greatly, even from block to block or building to building. Damage rating is (at best) an exercise in educated guessing. Even experienced damage-survey meteorologists and wind engineers can and often do disagree among themselves on a tornado's strength. Who surveys tornado damage? What are the criteria for the National Weather Service to do a survey? This varies from place to place; and there is no rigid criteria. The responsibility for damage survey decisions at each NWS office usually falls on the Warning-Coordination Meteorologist (WCM) and/or the Meteorologist in Charge (MIC). Budget constraints keep every tornado path from having a direct ground survey by NWS personnel; so spotter, chaser, and news accounts may be used to rate relatively weak, remote, or brief tornadoes. Killer tornadoes, those striking densely populated areas, or those generating reports of exceptional damage are given highest priority for ground surveys. Most ground surveys involve the WCM and/or forecasters not having shift responsibility the day of the survey. For outbreaks and unusually destructive events—usually only a few times a year—the NWS may support involvement by highly experienced damage survey experts and wind engineers from elsewhere in the country. Aerial surveys are expensive and usually reserved for tornado events with multiple casualties and/or massive amounts of damage. Sometimes, local NWS offices may have a cooperative agreement with local media or police to use their helicopters during surveys. Do mobile homes attract tornadoes? Of course not. It may seem that way, considering most tornado deaths occur in them, and that some of the most graphic reports of tornado damage come from mobile home communities. The reason for this is that mobile homes are, in general, much easier for a tornado to damage and destroy than well-built houses and office buildings. A brief, relatively weak tornado which may have gone undetected in the wilderness—or misclassified as severe straight-line thunderstorm winds while doing minor damage to sturdy houses—can blow a mobile home apart. Historically, mobile home parks have been reliable indicators, not attractors, of tornadoes. How can a tornado destroy one house and leave the next one almost unscratched? Most of the time, this happens either with multiple-vortex tornadoes or very small, intense single-vortex tornadoes. The winds in most of a multivortex tornado may only be strong enough to do minor damage to a particular house. But one of the smaller embedded subvortices, perhaps only a few dozen feet across, may strike the house next door with winds over 200 mph, causing complete destruction. Also, there can be great differences in construction from one building to the next, so that even in the same wind speed, one may be flattened while the other is barely nicked. How do tornadoes do strange things, like drive straw into trees, strip road pavement, and drive splinters into bricks? The list of bizarre things attributed to tornadoes is almost endless. Much of it is folklore; but there are some weird scenes in tornado damage. Asphalt pavement may strip when tornado winds sandblast the edges with gravel and other small detritus, eroding the edges and causing chunks to peel loose from the road base. Storm chasers and damage surveyors have observed this phenomenon often after the passage of a violent tornado. With a specially designed cannon, wind engineers at Texas Tech University have fired boards and other objects at over 100 mph into various types of construction materials, duplicating some of the types of "bizarre" effects, such as wood splinters embedded in bricks. Intense winds can bend a tree or other objects, creating cracks in which debris (e.g., hay, straw) becomes lodged before the tree straightens and the crack tightens shut again. All bizarre damage effects have a physical cause inside the roiling maelstrom of tornado winds. We do not fully understand what some of those causes are yet, however; because much of it is almost impossible to simulate in a lab. Do tornadoes really pick up objects and carry them for miles? Who does research on it? Yes, numerous tornadoes have lofted (mainly light) debris many miles into the sky, which was then carried by middle- and upper-atmospheric winds for long distances. The vertical winds in tornadoes can be strong enough to temporarily levitate even heavy objects if they have a large face to the wind or flat sides (like roofs, walls, trees, and cars), and are strong enough to carry lightweight objects tens of thousands of feet high. Though the heaviest objects, such as railroad cars, can only be airborne for short distances, stories of checks and other papers found over 100 miles away are often true. The Worcester, Massachusetts, tornado on June 9, 1953 carried mattress pieces high into the thunderstorm, where they were coated in ice, before they fell into Boston Harbor. Pilots reported seeing debris fluttering through the air at high altitude near the thunderstorm which spawned the Ruskin Heights, Missouri tornado on May 20, 1957. Is it helpful to open house windows to equalize pressure? Or is that a bad thing to do? Opening the windows is absolutely useless, a waste of precious time, and can be very dangerous. Do not do it. You may be injured by flying glass while trying to do it. And if the tornado hits your home, it will blast the windows open anyway. Is it safe to run under a bridge to ride out a tornado? 1. Deadly flying debris can still be blasted into the spaces between bridge and grade—and impale in any people hiding there. 2. Even when strongly gripping the girders (if they exist), people may be blown loose, out from under the bridge and into the open—possibly well up into the tornado itself. Chances for survival are not good if that happens. 3. The bridge itself may fail, peeling apart and creating large flying objects, or even collapsing down onto people underneath. The structural integrity of many bridges in tornado winds is unknown—even for those that may look sturdy. 4. Whether or not the tornado hits, parking on traffic lanes is illegal and dangerous to yourself and others. It creates a potentially deadly hazard for others, who may plow into your vehicle at full highway speeds in the rain, hail, and/or dust. Also, it can trap people in the storm's path against their will, or block emergency vehicles from saving lives. The people in that infamous video were extremely fortunate not to have been hurt or killed. They were actually not inside the tornado vortex itself, but instead in a surface inflow jet—a small belt of intense wind flowing into the base of the tornado a few dozen yards to their south. Even then, flying debris could have caused serious injury or death. More recently, on May 3, 1999, two people were killed and several others injured outdoors in Newcastle and Moore, Oklahoma, when a violent tornado blew them out from under bridges on I-44 and I-35. Another person was killed that night in his truck, which was parked under a bridge. So if a person is in a car, which is supposed to be very unsafe, and should not get under a bridge, what can he or she do? Vehicles are notorious as death traps in tornadoes, because they are easily tossed and destroyed. Either leave the vehicle for sturdy shelter or drive out of the tornado's path. When the traffic is jammed or the tornado is bearing down on you at close range, your only option may be to park safely off the traffic lanes, get out, and find a sturdy building for shelter, if possible. If not, lie flat in a low spot, as far from the road as possible (to avoid flying vehicles). However, in open country, the best option is to escape if the tornado is far away. If the traffic allows, and the tornado is distant, you probably have time to drive out of its path. Watch the tornado closely for a few seconds compared to a fixed object in the foreground (such as a tree, pole, or other landmark). If it appears to be moving to your right or left, it is not moving toward you. Still, you should escape at right angles to its track: to your right if it is moving to your left, and vice versa—just to put more distance between you and its path. If the tornado appears to stay in the same place, growing larger or getting closer—but not moving either right or left—it is headed right at you. You must take shelter away from the car or get out of its way fast! Is it best to go to the southwest corner of a basement in a tornado? Not necessarily. The southwest corner is no safer than any other part of the basement, because walls, floors, and furniture can collapse (or be blown) into any corner. The "safe southwest corner" is an old myth based on the belief that, since tornadoes usually come from the southwest, debris will preferentially fall into the northeast side of the basement. There are several problems with this concept, including: (1) tornadoes are not straight-line winds, even on the scale of a house, so the strongest wind may be blowing from any direction; and (2) tornadoes themselves may arrive from any direction. In a basement, the safest place is under a sturdy workbench, mattress, or other such protection—and out from under heavy furniture or appliances resting on top of the floor above. So-called "safe rooms" are reinforced small rooms built in the interior of a home, which are fortified by concrete and/or steel to offer extra protection against tornadoes, hurricanes, and other severe windstorms. They can be built in a basement, or if no basement is available, on the ground floor. In existing homes, interior bathrooms or closets can be fortified into "safe rooms" also. What about tornado safety in sports stadiums or outdoor festivals? Excellent question—and a very, very disturbing one to many meteorologists. Tornadoes have passed close to such gatherings on a few occasions, including a horse race in Omaha on May 6, 1975, and a crowded dog track in West Memphis, Arkansas on December 14, 1987. A supercell without a tornado hit a riverside festival in Fort Worth in 1995, catching over 10,000 people outdoors and bashing many of them with hail larger than baseballs. Just in the last few years, tornadoes have hit the football stadium for the NFL Tennessee Titans, and the basketball arena for the NBA Utah Jazz. Fortunately, they were both nearly empty of people at the time. There is the potential for massive death tolls if a stadium or fairground is hit by a tornado during a concert, festival, or sporting event—even with a warning in effect. Fans may never know about the warning; and even if they do, mass-panic could ensue and result in casualties even if the tornado does not hit. Stadium and festival managers should work with local emergency management officials to develop a plan for tornado emergencies—both for crowd safety during the watch and warning stages, and (similar to a terrorism plan) for dealing with mass casualties after the tornado. What would happen if a large, violent tornado hit a major city today? This has happened on several occasions, most recently in parts of Oklahoma City on May 3, 1999. Because of excellent, timely watches and warnings and intense media coverage of the Oklahoma tornado long before it hit, only 36 people were killed. The damage toll exceeded $1 billion, making it the costliest tornado in U.S. history. Still, it did not strike downtown, and passed over many miles of undeveloped land. Moving the same path north or south in the same area may have led to much greater death and damage tolls. The threat exists for a far worse disaster. Placing the same tornado outbreak in the Dallas-Ft. Worth Metroplex, especially during rush hour gridlock (with up to 62,000 vehicles stuck in the path), the damage could triple what was done in Oklahoma. There could be staggering death tolls in the hundreds or thousands, and overwhelmed emergency services. Ponder the prospect of such a tornado's path in downtown Dallas, for example. The North Texas Council of Governments and NWS Ft. Worth has compiled a very detailed study of several such violent tornado disaster scenarios in the Metroplex, which could be adapted to other major metro areas as well. Although they are common in the Great Plains, not all places have "tornado warning" sirens. Is this because tornadoes do not occur everywhere? Isn't every place required to have sirens? has no control. There is no nationwide requirement for tornado sirens. The NWS issues watches and warnings; but it is up to local governments to have a community readiness system in place for their citizens. In conversations with emergency managers and spotter coordinators, it has been found that the two most common reasons for a lack of sirens are low budgets and the perception that tornadoes cannot happen in an area. The latter is false; and the former is a matter of fiscal priorities. Your city and/or county emergency manager is the first person to ask about the tornado preparedness program in your community. June 19, 2001 ... Siren, WI. A tornado destroyed this town of 900 people some 65 miles northeast of St. Paul, MN. Three people were killed and 14 injured. A man and wife were playing cards with their son when they heard on the police scanner that a bad storm was coming. The wife reached the basement steps when a wall collapsed and pushed her into a counter. The husband curled into a fetal position and watched as linoleum tiles were ripped off the kitchen floor. Another couple huddled in their bath-room as the tornado tore down their house. They escaped with bruises. Siren has a village siren but it was damaged by lightning in late April or May. Repairs had been scheduled for the next week. April 15, 1996 ... A woman rode her bathtub to safety when a tornado ripped through Pilot, NC. She ran into the bathroom and got in the tub, "hearing it was a good thing to do," and rode the tub out into the woods. She landed in the trees and crawled out through the briars. February 23, 1998 ... Kissimmee, FL. In the Flamingo Lakes area, many said it was a miracle no one was killed. One woman grabbed her eight-year-old daughter out of her bed and returned to find the bed covered with shattered glass. Another woman, 69, recovering from hip surgery and plagued by old polio infirmities, was sitting in a big, overstuffed chair in her bedroom on the second floor watching TV, her daughter was asleep downstairs. The tornado hit with full force. In an instant, the roof and all four walls of the second floor were gone, and the older female was pinned in the chair by a wayward 18-inch satellite dish. Neighbors found her, after it was over, sitting in the chair, exposed to the night sky, without a scratch. She said "it was raining 250 miles per hour" and recalled "I said, If this is the time, don't let me go in water, I'm afraid of Mother Nature." In another home, a family found their cat trapped inside a washing machine. How the cat got inside the washing machine, which was covered with debris, remains a mystery. How does a person become a storm spotter? Local National Weather Service offices offer spotter-training sessions each year. Contact the Warning Coordination Meteorologist at the office that serves you for information on when and where they conduct these sessions, and how to become a spotter for them. There is also a national spotters' organization, SKYWARN, that can help you learn about storm spotting and get you in contact with spotting experts. What is the difference between a spotter and a chaser? The differences are in method and motivation. Chasers are more mobile than spotters, and unlike most spotters, travel hundreds of miles and across state lines to observe storms. Spotters' primary function is to report critical weather information, on a live basis, to the National Weather Service through some kind of local spotter coordinator. Chasers, on the other hand, may be doing it for any number of reasons, including scientific field programs, storm photography, self-education, commercial video opportunity, or news media coverage. Some storm spotters also do occasional chasing outside their home area; and some chasers are certified and equipped to do real-time spotting. Who does scientific tornado research? The National Severe Storms Laboratory has been the major force in tornado-related research for several decades. NSSL has been a leader in Doppler radar development, research, and testing, and has run numerous field programs to study tornadoes and other severe weather since the early 1970s. Others heavily involved with tornado research include UCAR/NCAR, the University of Oklahoma, the Tornado Project, and overseas, TORRO (UK). Members of the SELS/SPC staff have done research related to forecasting tornadoes for many years. Almost every university with an atmospheric science program, as well as many local National Weather Service offices, have also published some tornado-related studies. Has there ever been anything done like "Dorothy" in the movie Twister? What was TOTO? In Twister , "Dorothy" was a large, reinforced metal bin containing small instrument pods that, with help from refabricated Pepsi cans, were supposed to be drawn into a tornado when the tornado cracked "Dorothy" open. 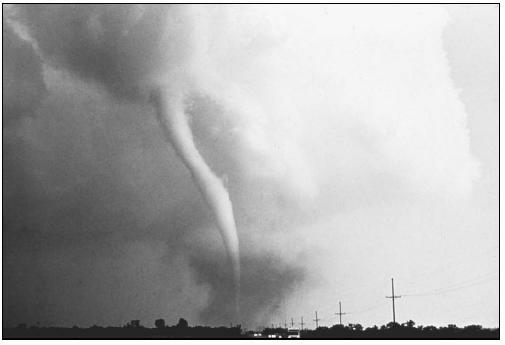 The idea for "Dorothy" was taken from a real device that University of Oklahoma and NSSL weather scientists used in the early to mid-1980s called TOTO—the TOtable Tornado Observatory. That was the acronym for Verification of the Origin of Rotation in Tornadoes EXperiment, conducted in the springs of 1994 and 1995 in the southern and central U.S. plains. The basic idea was to gather the densest possible set of observations in tornadic supercells, from sensors in cars, planes, balloons, "turtles" (small instrument packages that could be placed on the ground), and portable radars. The main goal is to better understand the cause of tornado formation in thunderstorms. NOTE: Having happened before the era of comprehensive damage surveys, some of these events may have been composed of multiple tornadoes along a damage path. 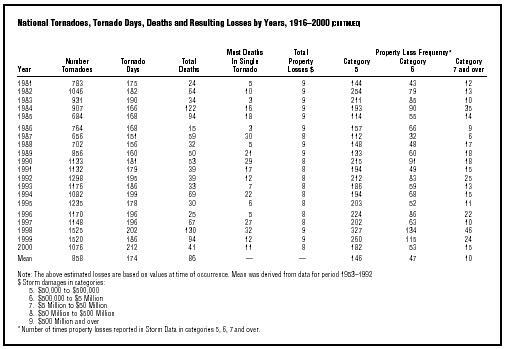 Death counts for events in the 1800s and early 1900s should be treated as estimates since recordkeeping of tornado deaths was erratic back then. 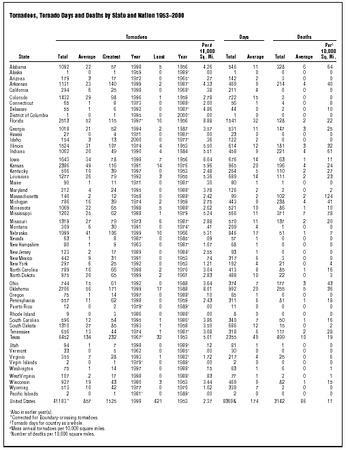 State Total Average Greatest Year Least Year Per # 10,000 Sq. Mi. 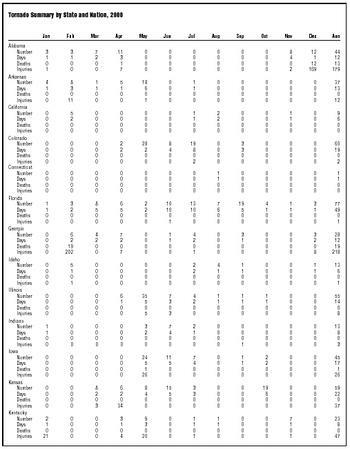 Total Average Total Average Per 10,000 1 Sq. Mi. + Also in earlier year(s). * Corrected for Boundary-crossing tornadoes. & Tornado days for country as a whole. # Mean annual tornadoes per 10,000 square miles. 1 Number of deaths per 10,000 square miles. 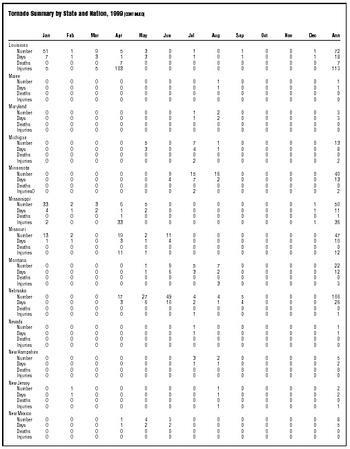 *Number of times property losses reported in Storm Data in categories 5, 6, 7 and over. Thanks for the info in this website. I was in a middle of a tornado on June this year. And now we move to a bigger town...And I had a question..I live in upper part of Texas and yes we do have tornadoes every year here. But one hit Vernon more then 15 years ago...I live in the center part of the town and I wonder when a tornado hits does it travel in the center part of a town??? And do they usually form outside of a town or in the open field?...Thank you for your time...This really scares me ever sense we got hit by one when I was living in the other town call Odell, TX. Web sight was very helpful in settling a disagreement with a co worker who says New Jersey never gets tornados. As someone who has lived here (South Jersey) since I was 3, (57 now), I can say we do get them from time to time. They are no where near as bad as in tornado alley, but they have happened. Most likely times have been when a hurricane was close by. too much info about the past but why not about the tornadoes in 2009 or onwards and how many countries has tornado Alley effected? what are the effects? PLEASE!! help me to understand how the winds of a tornado act at ground level and how that rationale supports the theory that by laying prone JUST a foot below the actual ground level, one would significantly decrease the chances of getting hit from debris (as long as you didn't 'poke ya head up"). My wife thinks Im crazy and she would simply just get lift, and blow away! HELP ME PLEASE! 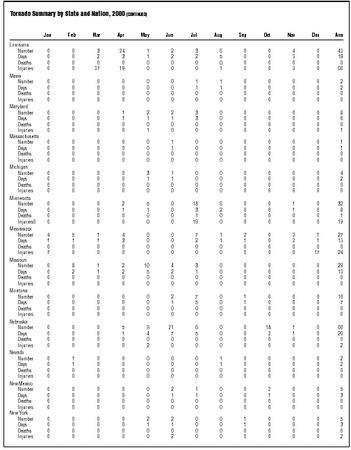 How many tornadoes hit Georgia between 2001 and 2010? I need the the totals for each yuear. Can a tornado make a loud popping noise? My mom said that she felt her house and bed shake friday night during our storm warnings, then as the shaking stopped she heard a loud pop. She wondered if it could have been a tornado that started to sit down then went back up. Any info would be great. Thank you! I live in Crestview, FL. Who can I contact to come & tell/show me in my house the safest place to ride out a tornado or hurricane? You have some incorrect information in your comments. The 2001 Tornado of Mossy Grove was an F4 and killed 7 people. The information on the fatality you posted: Fatality associated with tree falling onto mobile home. 22 Nov 10 07:40 PM Mossy Grove/Petros TN 7 F3 WT746, is incorrect. Seven people lost their lives and it was not from a tree falling onto a mobile home. I know because I am from Petros. Please correct your information. Thank you. Any data on cars parked in a garage after a tornado hits the house/garage? I have seen a lot of pictures of partially destroyed homes with cars parked in the garage. I've seen pictures where the only thing left was the slab (Moore Oklahoma) but I don't know if there were any cars parked there. I understand a lot of pros and cons of being in a garage in a car during a tornado, but I would like to know the science (data) to rate this as a survivable location during a storm. How do tornados affect people and animals? How do tornados stop in the path that they are going in? How much does the damage of a tornado cost? What is the biggest recorded storm of that nature? Wish refeences concerning the hydrodynamical theory of waterspouts and tornadoes for my research with students. are tornadoes subject to hit when temperatures are higher than 66 degrees.